As we near the official end of summer, we are starting to feel it, with cool mornings and a little rain. But the fishing is still quite good! For salmon, there are still some chinook/springs around, but they are getting less frequent and a little dark, as they prepare to head up river to spawn. One report earlier this week had a local angler losing a 40 pounder right at the boat this week, unfortunately unable to net it solo! (though the one that got away always seems bigger and bigger as your mind plays tricks on you) Most of the attention is on the coho salmon lately. You can presently keep 2 hatchery coho, and it seems that some days there's lots around and others it is all wild coho that have to be released. Please release them gently, so they can survive and spawn lots more. 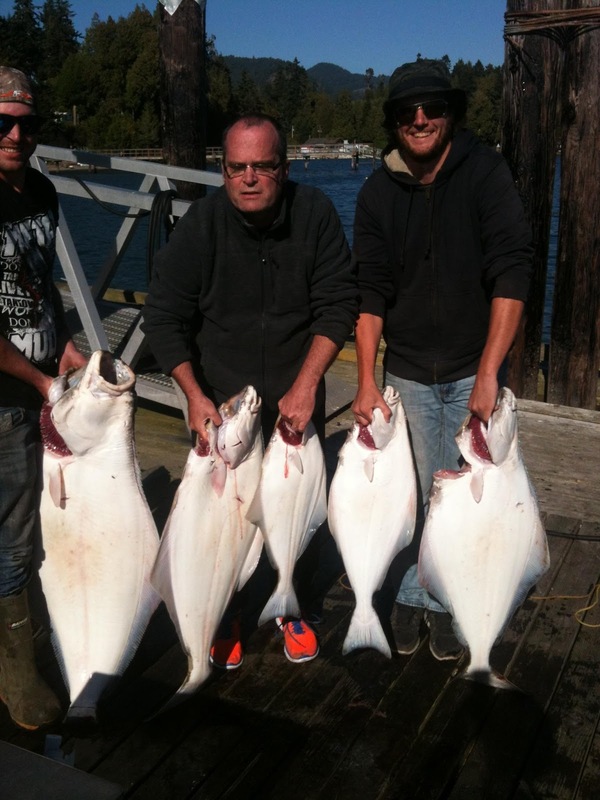 Local anglers are turning their attention to halibut. Luke from VIP Fishing Charters sent in this photo of a great day "somewhere west". That's some nice white gold there ... a fish feast for sure. Reports of nice halibut caught right outside Sooke harbourmouth and then in all the usual hotspots.....keep an eye on the tides and give it a shot. Bundle up and get out there ... lots of fishing to be had before the monsoon season hits!